A monopoly (from Greek μόνος, mónos, 'single, alone' and πωλεῖν, pōleîn, 'to sell') exists when a specific person or enterprise is the only supplier of a particular commodity. This contrasts with a monopsony which relates to a single entity's control of a market to purchase a good or service, and with oligopoly which consists of a few sellers dominating a market. 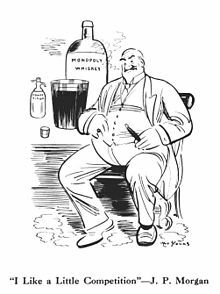 Monopolies are thus characterized by a lack of economic competition to produce the good or service, a lack of viable substitute goods, and the possibility of a high monopoly price well above the seller's marginal cost that leads to a high monopoly profit. The verb monopolise or monopolize refers to the process by which a company gains the ability to raise prices or exclude competitors. In economics, a monopoly is a single seller. In law, a monopoly is a business entity that has significant market power, that is, the power to charge overly high prices. Although monopolies may be big businesses, size is not a characteristic of a monopoly. A small business may still have the power to raise prices in a small industry (or market). Economic barriers: Economic barriers include economies of scale, capital requirements, cost advantages and technological superiority. Economies of scale: Decreasing unit costs for larger volumes of production. Decreasing costs coupled with large initial costs, If for example the industry is large enough to support one company of minimum efficient scale then other companies entering the industry will operate at a size that is less than MES, and so cannot produce at an average cost that is competitive with the dominant company. Finally, if long-term average cost is constantly decreasing[clarification needed], the least cost method to provide a good or service is by a single company. A monopolist can extract only one premium,[clarification needed] and getting into complementary markets does not pay. That is, the total profits a monopolist could earn if it sought to leverage its monopoly in one market by monopolizing a complementary market are equal to the extra profits it could earn anyway by charging more for the monopoly product itself. However, the one monopoly profit theorem is not true if customers in the monopoly good are stranded or poorly informed, or if the tied good has high fixed costs. is the price elasticity of demand the firm faces. The markup rules indicate that the ratio between profit margin and the price is inversely proportional to the price elasticity of demand. The implication of the rule is that the more elastic the demand for the product the less pricing power the monopoly has. Price discrimination allows a monopolist to increase its profit by charging higher prices for identical goods to those who are willing or able to pay more. For example, most economic textbooks cost more in the United States than in developing countries like Ethiopia. In this case, the publisher is using its government-granted copyright monopoly to price discriminate between the generally wealthier American economics students and the generally poorer Ethiopian economics students. Similarly, most patented medications cost more in the U.S. than in other countries with a (presumed) poorer customer base. Typically, a high general price is listed, and various market segments get varying discounts. This is an example of framing to make the process of charging some people higher prices more socially acceptable. Perfect price discrimination would allow the monopolist to charge each customer the exact maximum amount he would be willing to pay. This would allow the monopolist to extract all the consumer surplus of the market. While such perfect price discrimination is a theoretical construct, advances in information technology and micromarketing may bring it closer to the realm of possibility. It is very important to realize that partial price discrimination can cause some customers who are inappropriately pooled with high price customers to be excluded from the market. For example, a poor student in the U.S. might be excluded from purchasing an economics textbook at the U.S. price, which the student may have been able to purchase at the Ethiopian price'. Similarly, a wealthy student in Ethiopia may be able to or willing to buy at the U.S. price, though naturally would hide such a fact from the monopolist so as to pay the reduced third world price. These are deadweight losses and decrease a monopolist's profits. As such, monopolists have substantial economic interest in improving their market information and market segmenting. A company wishing to practice price discrimination must be able to prevent middlemen or brokers from acquiring the consumer surplus for themselves. The company accomplishes this by preventing or limiting resale. Many methods are used to prevent resale. For instance, persons are required to show photographic identification and a boarding pass before boarding an airplane. Most travelers assume that this practice is strictly a matter of security. However, a primary purpose in requesting photographic identification is to confirm that the ticket purchaser is the person about to board the airplane and not someone who has repurchased the ticket from a discount buyer. Contrary to common misconception, monopolists do not try to sell items for the highest possible price, nor do they try to maximize profit per unit, but rather they try to maximize total profit. A government-granted monopoly (also called a "de jure monopoly") is a form of coercive monopoly, in which a government grants exclusive privilege to a private individual or company to be the sole provider of a commodity. Monopoly may be granted explicitly, as when potential competitors are excluded from the market by a specific law, or implicitly, such as when the requirements of an administrative regulation can only be fulfilled by a single market player, or through some other legal or procedural mechanism, such as patents, trademarks, and copyright. In a free market, monopolies can be ended at any time by new competition, breakaway businesses, or consumers seeking alternatives. In a highly regulated market environment a government will often either regulate the monopoly, convert it into a publicly owned monopoly environment, or forcibly fragment it (see Antitrust law and trust busting). Public utilities, often being naturally efficient with only one operator and therefore less susceptible to efficient breakup, are often strongly regulated or publicly owned. American Telephone & Telegraph (AT&T) and Standard Oil are often cited as examples of the breakup of a private monopoly by government. Standard Oil never achieved monopoly status, a consequence of existing in a market open to competition for the duration of its existence. The Bell System, later AT&T, was protected from competition first by the Kingsbury Commitment, and later by a series of agreements between AT&T and the Federal Government. In 1984, decades after having been granted monopoly power by force of law, AT&T was broken up into various components, MCI, Sprint, who were able to compete effectively in the long distance phone market. ^ Milton Friedman (February 2002) . "VIII: Monopoly and the Social Responsibility of Business and Labor". Capitalism and Freedom (paperback) (40th anniversary ed.). The University of Chicago Press. p. 208. ISBN 0-226-26421-1. ^ a b Orbach, Barak; Campbell, Grace (2012). "The Antitrust Curse of Bigness". Southern California Law Review. SSRN 1856553. ^ Binger and Hoffman (1998), p. 391. ^ Goodwin, N; Nelson, J; Ackerman, F; Weisskopf, T (2009). Microeconomics in Context (2nd ed.). Sharpe. pp. 307–308. ^ Samuelson, William F.; Marks, Stephen G. (2003). Managerial Economics (4th ed.). Wiley. pp. 365–366. ^ a b Nicholson, Walter; Snyder, Christopher (2007). Intermediate Microeconomics. Thomson. p. 379. ^ Frank (2009), p. 274. ^ Samuelson & Marks (2003), p. 365. ^ Ayers, Rober M.; Collinge, Robert A. (2003). Microeconomics. Pearson. p. 238. ^ Pindyck and Rubinfeld (2001), p. 127. ^ Png, Ivan (1999). Managerial Economics. Blackwell. p. 271. ISBN 1-55786-927-8. ^ Png (1999), p. 268. ^ Negbennebor, Anthony (2001). Microeconomics, The Freedom to Choose. CAT Publishing. ^ Mankiw (2007), p. 338. ^ a b Hirschey, M (2000). Managerial Economics. Dreyden. p. 426. ^ Pindyck, R; Rubinfeld, D (2001). Microeconomics (5th ed.). Prentice-Hall. p. 333. ^ Melvin and Boyes (2002), p. 245. ^ Varian, H (1992). Microeconomic Analysis (3rd ed.). Norton. p. 235. ^ Pindyck and Rubinfeld (2001), p. 370. ^ Frank (2008), p. 342. ^ Pindyck and Rubenfeld (2000), p. 325. ^ Nicholson (1998), p. 551. ^ Perfectly competitive firms are price takers. Price is exogenous and it is possible to associate each price with unique profit maximizing quantity. Besanko, David, and Ronald Braeutigam, Microeconomics 2nd ed., Wiley (2005), p. 413. ^ a b Binger, B.; Hoffman, E. (1998). Microeconomics with Calculus (2nd ed.). Addison-Wesley. ^ a b c Frank (2009), p. 377. ^ Frank (2009), p. 378. ^ Depken, Craig (November 23, 2005). "10". Microeconomics Demystified. McGraw Hill. p. 170. ISBN 0-07-145911-1. ^ Davies, Glyn; Davies, John (July 1984). "The revolution in monopoly theory". Lloyds Bank Review (153): 38–52. ^ Levine, David; Boldrin, Michele (2008-09-07). Against intellectual monopoly. Cambridge University Press. p. 312. ISBN 978-0-521-87928-6. ^ a b Tirole, p. 66. ^ Hirschey (2000), p. 412. ^ Melvin, Michael; Boyes, William (2002). Microeconomics (5th ed.). Houghton Mifflin. p. 239. ^ Pindyck and Rubinfeld (2001), p. 328. ^ Varian (1992), p. 233. ^ Krugman, Paul; Wells, Robin (2009). Microeconomics (2nd ed.). Worth. ^ Samuelson and Marks (2006), p. 107. ^ a b Boyes and Melvin, p. 246. ^ Perloff (2009), p. 404. ^ a b Perloff (2009), p. 394. ^ a b Besanko and Beautigam (2005), p. 449. ^ a b c Boyes and Melvin, p. 449. ^ Varian (1992), p. 241. ^ a b Perloff (2009), p. 393. ^ Besanko and Beautigam (2005), p. 448. ^ Hall, Robert E.; Liberman, Marc (2001). Microeconomics: Theory and Applications (2nd ed.). South_Western. p. 263. ^ Besanko and Beautigam (2005), p. 451. 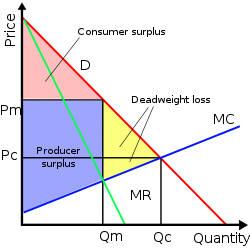 ^ If the monopolist is able to segment the market perfectly, then the average revenue curve effectively becomes the marginal revenue curve for the company and the company maximizes profits by equating price and marginal costs. That is the company is behaving like a perfectly competitive company. The monopolist will continue to sell extra units as long as the extra revenue exceeds the marginal cost of production. The problem that the company has is that the company must charge a different price for each successive unit sold. ^ Varian (1992), p. 242. ^ Perloff (2009), p. 396. ^ Because MC is the same in each market segment the profit maximizing condition becomes produce where MR1 = MR2 = MC. Pindyck and Rubinfeld (2009), pp. 398–99. ^ Colander, David C., p. 269. ^ Note that the discounts apply only to tickets not to concessions. The reason there is not any popcorn discount is that there is not any effective way to prevent resell. A profit maximizing theater owner maximizes concession sales by selling where marginal revenue equals marginal cost. ^ a b Lovell (2004), p. 266. ^ Frank (2008), p. 394. ^ Frank (2008), p. 266. ^ McConnell, Campbell R. Economics : principles, problems, and policies / Campbell R. McConnell, Stanley L. Brue.– 17th ed. ^ Binger and Hoffman (1998), p. 406. ^ Samuelson, W; Marks, S (2005). Managerial Economics (4th ed.). Wiley. p. 376. ^ a b Samuelson and Marks (2003), p. 100. ^ Riggs, Thomas; Bonk, Mary, eds. (2008). "Government-Granted Monopoly". Everyday Finance: Economics, Personal Money Management, and Entrepreneurship. Detroit: Gale Cengage Learning. ISBN 978-1-4144-1049-4. LCCN 2007035070. OL 21557400M. Archived from the original on 19 April 2018. Retrieved 6 November 2018. ^ a b c Frank, Robert H. (2008). Microeconomics and Behavior (7th ed.). McGraw-Hill. ISBN 978-0-07-126349-8. ^ Aristotle. Politics (350 B.C.E ed.). ^ Aristotle. Politics. p. 1252α. ^ Segal, M.H. (1948). "Demai: Translated into English with Notes". In Epstein, I. The Talmud. Zeraim vol. II. London: The Soncino Press. p. 69. ISBN 9789562913447. Rabbi Judah agrees that if a man bought from a monopolist, he must tithe every heap. ^ Richardson, Gary (June 2001). "A Tale of Two Theories: Monopolies and Craft Guilds in Medieval England and Modern Imagination". Journal of the History of Economic Thought. ^ Chazelas, Jean (1968). "La suppression de la gabelle du sel en 1945". Le rôle du sel dans l'histoire: travaux préparés sous la direction de Michel Mollat. Presses universitaires de France: 263–65. ^ Gollan, Robin (1963). The Coalminers of New South Wales: a history of the union, 1860–1960. Melbourne: Melbourne University Press. pp. 45–134. ^ "Exxon Mobil – Our history". Exxon Mobil Corp. Retrieved 2009-02-03. ^ Morris, Charles R. The Tycoons: How Andrew Carnegie, John D. Rockefeller, Jay Gould, and J.P. Morgan invented the American supereconomy, H. Holt and Co., New York, 2005, pp. 255–258. ISBN 0-8050-7599-2. ^ Boselovic, Len (February 25, 2001). "Steel Standing: U.S. Steel celebrates 100 years". PG News – Business & Technology. post-gazette.com – PG Publishing. Retrieved 6 August 2013. ^ "West's Encyclopedia of American Law". Answers.com. 2009-06-28. Retrieved 2011-10-11. ^ Kevin J. O'Brien, IHT.com, Regulators in Europe fight for independence, International Herald Tribune, November 9, 2008, Accessed November 14, 2008. ^ IfM – Comcast/NBCUniversal, LLC. Mediadb.eu (2013-11-15). Retrieved on 2013-12-09. ^ Van Boven, M. W. "Towards A New Age of Partnership (TANAP): An Ambitious World Heritage Project (UNESCO Memory of the World – reg.form, 2002)". VOC Archives Appendix 2, p.14. ^ Leo Cendrowicz (2008-02-27). "Microsoft Gets Mother Of All EU Fines". Forbes. Retrieved 2008-03-10. ^ "EU fines Microsoft record $1.3 billion". Time Warner. 2008-02-27. Archived from the original on 2008-03-03. Retrieved 2008-03-10. ^ Thomas J. DiLorenzo. "The Myth of Natural Monopoly – Thomas J. DiLorenzo – Mises Daily". Mises.org. Retrieved 2012-11-02.